Games were getting heated in the Wyoming Intermediate School classroom. Ace and king battles popped up in the card game, War; jacks were smacked silly in Slapjack and things got a little wild in Crazy Eights. 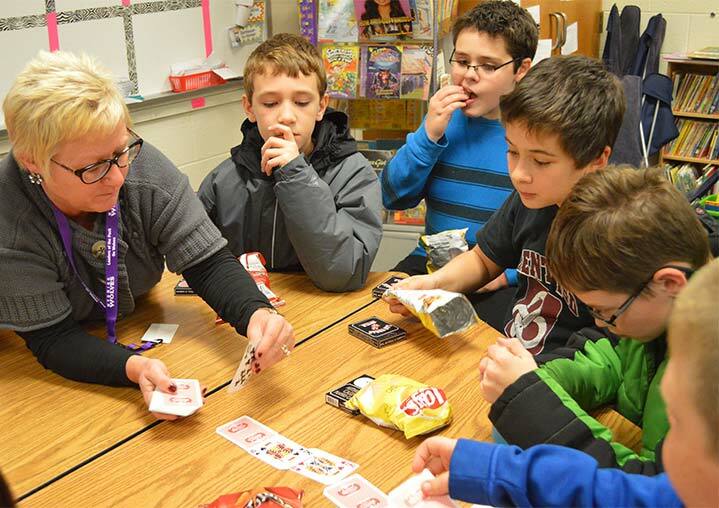 It was cards day in Game Club at the fifth- and sixth-grade school. 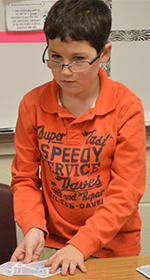 Sixth-grader Eric Moras and fifth-grader Thomas Austin took turns laying down their cards, gasping at a war of aces. “I joined because I wanted to relax after the school day,” Thomas said. Red Rover, Twister, birthday-game relays, Scrabble and Hungry, Hungry Hippos are just a few of the games a dozen students are playing. The weekly hour-long club was started by school counselor Christine Karas. In the techie world of video games and social media, Karas wanted to introduce students to the beloved time-worn games generations before them enjoyed. Karas was referring to the character-building skills she helps instill in students every day when they come to her office struggling with a range of personal issues. Games require students to take turns, learn to be good winners or losers, be patient, face frustration, problem-solve and take risks. Plus it requires lots of face-to-face interaction for shy students who like to hide in the back of the classroom, she said.